Figs. 1, 2, 3, 4. Histiastrum aster Lipman; v 180. 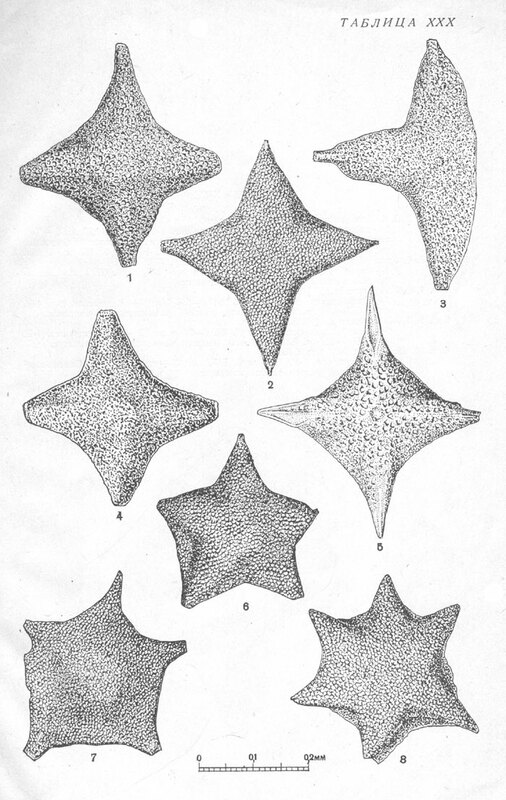 2 - typical specimen, Tyumen reference bore hole 1-R, dept 530 m; 1, 3, 4 - Tyumen reference bore hole 1-R, dept 527,2 m. Santonian-Campanian, lower radiolarian assemblage. Fig. 5. Histiastrum tumeniensis Lipman sp. nov.; x180. Holotype. Tyumen reference bore hole 1-R, dept 565,2 m. Santonian-Campanian, lower radiolarian assemblage. Figs. 6, 7. Pentinastrum subbotinae Lipman sp. nov.; x180. 6 – holotype, Tyumen reference bore hole 1-R, dept 530 m. Santonian-Campanian, lower radiolarian assemblage. Fig. 8. Hexinastrum cretaceum Lipman sp. nov.; x180. Holotype. Luchinkino bore hole 1-R, dept 377,75—384,35 m. Santonian-Campanian, lower radiolarian assemblage.